Free Willy at last - or is Keiko a cash cow ? Update, 12 December 2003: Keiko was found dead tonight after showing signs that he was having trouble breathing. The famous orca may have died of pneumonia. After 15 months in Halsa, Norway, Willy is free at last. According to his handlers his skeleton may go on exhibition. 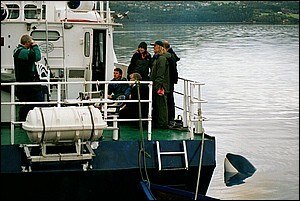 Update, 15 December 2003: Keiko was hauled ashore and buried at Taknes bay just before midnight last night. The Halsa municipality will most likely erect a monument on Keiko's grave. 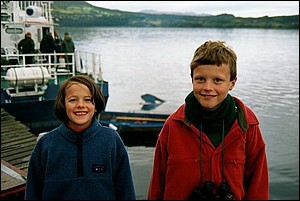 When Keiko left his pen on Iceland the Free Willy Foundation claimed efforts to return the orca to the wild a success. Other observers pointed out the project were low on cash and faith. 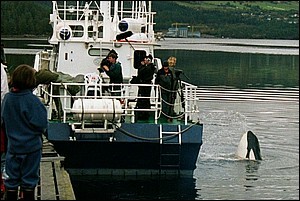 Some suggested Keiko was abandoned rather than released. In August eight former staffers for the orca's rehabilitation effort wrote a letter to federal marine officials saying the whale probably lacked the foraging and navigation skills to survive in the North Atlantic. Meanwhile the lonely orca swam east arriving in Skålvikfjorden, Norway on the 1st of September. 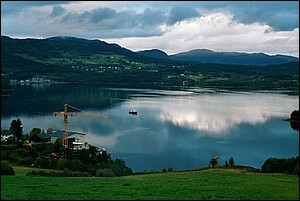 Skålvikfjorden is known for its beauty. Wrote the Sun-Herald, Sydney: "Thousands have already made the journey to the remote fiord of Skaalvik to pause on the rocks by its glassy waters and observe the star." In spite of scenery, glassy waters and rocks Keiko settled down in less than clear waters at the local shipyard. The yard, Klevset Mekaniske Verksted, is known for building excellent whalers. At night Keiko prefers to sleep under the quay at the yard, during the day he stays close to the Kompass, a small vessel chartered by the Keiko team. 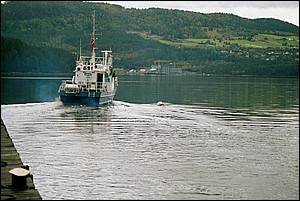 Keiko entered Norwegian waters seeking company. Human company. Suggested several reporters: "Had whales been half as intelligent as some claim, Keiko would have gone nowhere near Norway." 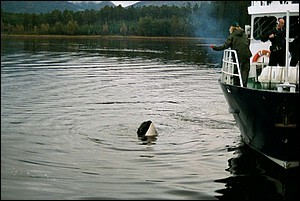 Maybe the orca knew something else; In Norway putting an orca in a tank would land the owner in a cell. 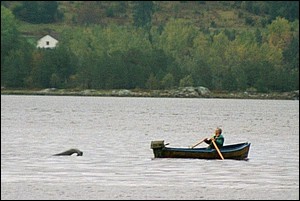 Since arriving in Norway, he has stuck close to a boat from which his handlers feed him herring. The M/S Kompass, the vessel chartered by Free Willy/Keiko Foundation is out in the bay. Lower left: Klevset Mekaniske Verksted. Keiko will approach any boat passing by, and pulls any trick to get attention. The 50 meter exclusion sone around Keiko is a joke. Successfully foraged on his own? When there are no other boats around Keiko simply stays close to the Kompass. There is much talk of "unrefuteable evidence" and "proof" of Keiko finding his own food. Our simple question is: Who has seen Keiko hunt and eat his prey? The official line of the Free Willy/Keiko Foundation is that Keiko must not be encouraged to act like the clown he used to be. Obviously this does not apply to fund raising. Every visiting TV crew will see a show of shaking, jiggeling, clapping, spurting water etc, etc. Some sort of high-frequency whistle is used to signal the programme. Yet another TV team is packing up. Keiko's concentration is fixed on the reward in coach Thorbjörg Kristjansdottir's hand. A minute earlier we saw Keiko swim straight through a school of profoundly shocked herring. The TV crew taking pictures of each other and the Keiko team. The star himself follows the departure with a keen eye. Keiko will never be part of a pod, he belongs with the crew. Why pretend he is on his way to even a semi-wild life? On our way back to our cabin we found the shop next to the ferry terminal at Åfarnes selling minke whale meat at five dollars a pound.